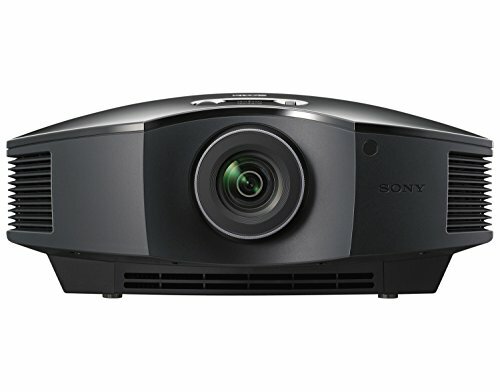 The Sony VPLHW45ES 1080p 3D SXRD is a great choice for a home theater and gaming projector. At less than $2,000, it gives buyers a bang for their buck. It’s not an entirely huge risk of an investment, as the price is relatively affordable; especially coming from a brand that’s already established as one of the best when it comes to home entertainment. Stunning home cinema projection from Sony is no surprise, but given the relative affordability, it really does gain a level of hype that it easily lives up to. With a screen size ranging from 40 to 300 inches, this full HD (1920 x 1080) resolution projector does its job really well. It has a lamp life of 6,000 hours, so you can enjoy your 1800 lumens of crisp imagery for a really long time. It uses Advanced Reality Creation for an amazing display and lifelike pictures. Using the included remote control, you can manually zoom in and out. Lastly, its motionflow technology offers “Combination mode.” This feature uses Sony’s Film Projection and Motion Enhancer capabilities, so viewers can add frames, reduce blur, and maintain brightness even in fast-moving scenes. The projector has a sleek convex design, and comes in black or white. Its exterior looks nondescript, which makes it seem familiar rather than intimidating. However, don’t be fooled – Sony says that despite the unassuming outward appearance, the inside of it has been completely redesigned so it delivers better images as described above, and practically zero fan noise (22 dB). It’s perfect for people who want a home theatre but are watching their budget, looking for an affordable projector that would not disappoint. It comes with a wireless remote control, 2 AA manganese batteries, and a lens cover to protect your unit’s most vital part. In addition, its lens shift feature allows vertical and horizontal shifting – giving you, the viewer, ultimate flexibility and crisp image quality no matter where you install your unit. Looking around for a great 3D Projector? Check out Household Audio’s list of Best 3D Projectors. Or, if you’re in the market for a 4K projector, check out our list of Best 4K Projectors! Sony VPL-HW45ES Review - One Of The Best Projectors Out There! Sony VPL-HW45ES Review - Is It Any Good?